Thandi and Themba, a White rhino cow and bull from the Eastern Cape were two of the very first survivors that made headlines over a year ago. Both were darted, their horns hacked off and they were left to die. The reserve management found them the next morning and immediately called in Dr Will Fowlds. He stabilised and treated both rhino for several weeks. Sadly, Themba died due to a leg injury that he sustained during the initial poaching incident. 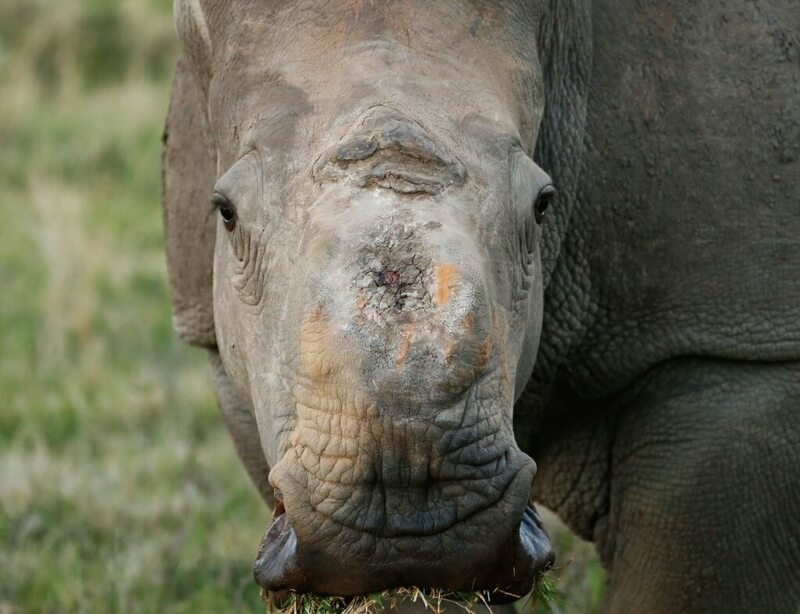 Thandi survived, but with severe facial injuries. Over the last several months, Saving the Survivors have been involved in her treatment and she has made a remarkable recovery. She even received a skin graft, but unfortunately, she damaged her face again. At her last treatment, blood was collected from Thandi to determine if she is pregnant, as she has been seen mating with a bull she has been walking with for the last few months. She was indeed pregnant and on the of 13 January 2015 she gave birth to baby . Then much to everyone’s surprise and delight, in late January 2017 she was seen with her second calf – baby Colin!